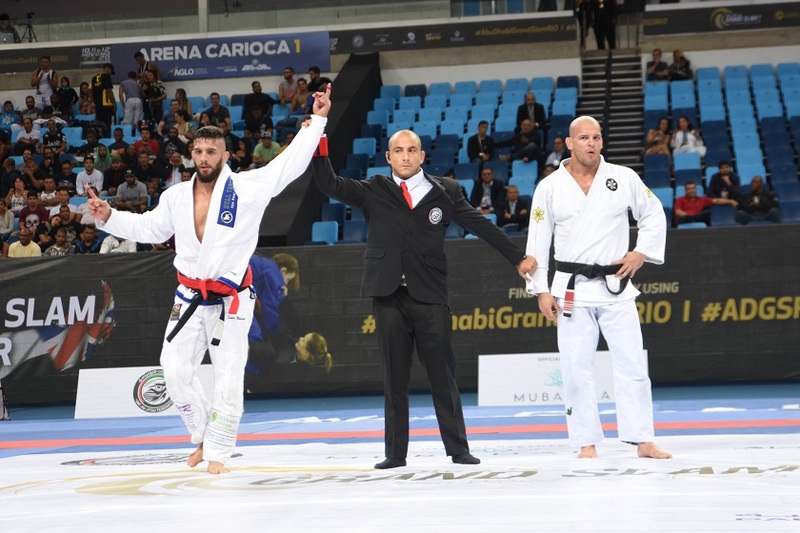 Rio De Janeiro – Abu Dhabi Grand Slam® Jiu-Jitsu World Tour Rio De Janeiro second day saw some exceptional energetic fights among the Brown and Black belt categories. The surprising news out of yesterday’s fights were the unexpected loss of Alexandre Ribeiro and Adam Wardzinski in the black belt 94kg division. The Carioca Arena at the Rio Olympic Park was rocking with over 6500 energetic fans in attendance, who at times, created a palpable atmosphere in the venue to cheer on the superstar black belts. Though Alexandre Ribeiro lost in a very tight decision at the 94kg black belt semi-finals where the scores were tied 0-0 with 2-2 advantage and 1-1 penalty, but the referee deemed Patrick Gaudio as the rightful winner due to his grit and attacking style of performance during the fight. It was really an exciting fight, where Ribeiro tried to go for the arm bar finish aggressively but was unable keep it locked in. Gaudio rallied in the final couple of minutes to walk away with a famous win over the legendary Ribeiro. Adam Wardzinski, lost via decision at the 94kg black belt quarter-finals with a score of 0-6 advantage against Guilherme Santos in another entertaining fight, which brought the crowd to its feet for six straight minutes. The Day 3 of Abu Dhabi Grand Slam® Rio De Janeiro continues today, 12th November from 10am to 7pm Brazil time, at the Carioca Arena, with the Male Black belt finals and Female Brown/Black belt finals. The event will be broadcasted live on Abu Dhabi Sports TV in UAE & MENA from 4pm UAE time, Combate in Brazil from 3pm Brazil time and worldwide live stream on FloGrappling.